Boston’s Fashion Week for 2012 is in full swing and one of today’s events is a Retail/Fashion Truck Showcase on City Hall Plaza. If you have an eyebrow raised wondering whether we mean Food Truck you wouldn’t be the only one. Though many in Boston are familiar with the sight of Food Trucks, the Fashion truck is still a more unusual occurrence. I was in the Faneuil Hall area recently since we had gone in to see the Boston Hub on Wheels events that ended on City Hall Plaza. Nope there weren’t any Fashion Trucks there but when we walked over to Faneuil Hall we found one for a retailer named Aether. We walked in and it is basically set us as a mini store. The truck itself pulls you in with the bullet style design so of course we had to take a look. They specialize in cold weather gear. We would never have known about them if not for this unorthodox way of them coming to the consumer. As with the Food Truck movement we are a little later than cities like Los Angeles for example but the fact that City Hall is using Boston’s Fashion Week to give Boston retailers a shot at displaying and selling their wares via a Fashion Truck shows that we are catching up on these types of trends much more quickly. 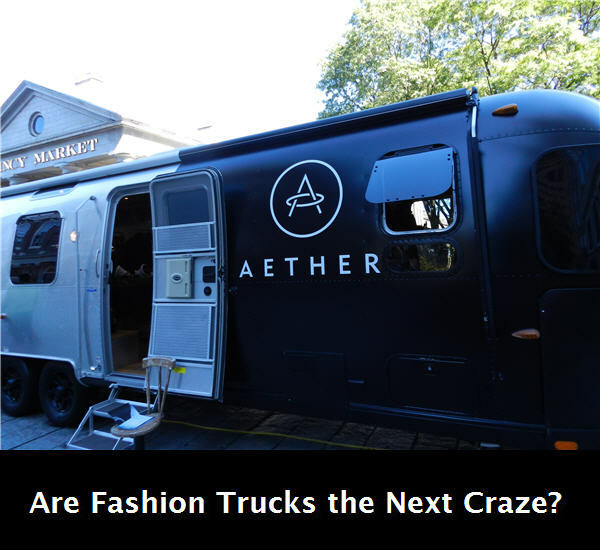 Boston is trying to embrace this new way for retailers to get their products out to the consumer but needs to work out some of the legal and logistical issues it becomes easier for the Fashion Truck owners to find good spaces that are affordable too. A big seller for choosing this business model is the savings in rent that comes from having a truck instead. For Boston Fashion Week, the City will be hosting a pilot Retail/Fashion Truck Showcase with six retail trucks on City Hall Plaza featuring The Fashion Truck, Lola’s Urban Vintage, ARTichoke, The Brkfst Clb, Sneakerbox, and the Boston Sports Apparel Company. For more information about the many other events for this year’s Boston Fashion Week visit their website.